Hi all, I have a model 1 Sega CD that requires a recap. 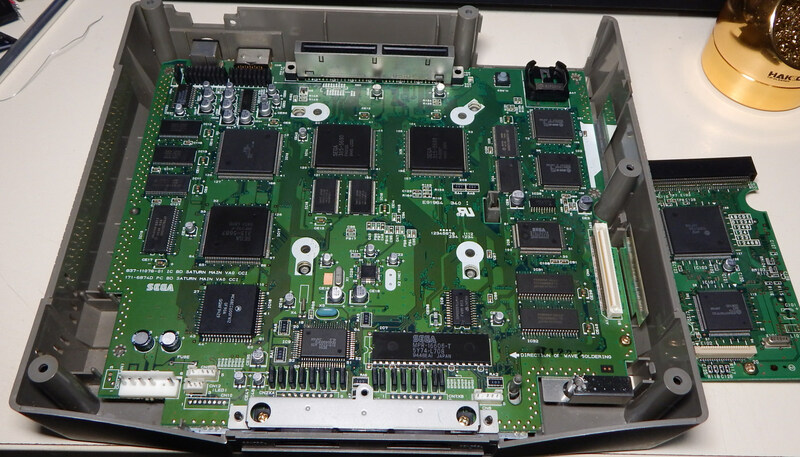 I was able to successfully recap my VA3 Genesis model 1 but looking at the circuit board for the Sega CD, it appears to be quite a bit denser. Also there are around 10 surface mounted caps that I do not have the tools to safely remove. I am located in Wisconsin, USA. Is there anyone in the US who is willing to do this? If so, what would you charge? Thanks. If you can't find anyone else to do this, let me know. My rates are usually higher though as I only do high end repairs. I also have a backlog I'm working through right now. But if you get stuck on finding someone, feel free to drop me a line. Maybe try contacting ebay member gamegears4you. Repairs game-gears but might help with SegaCD model 1. I just recapped my M1 Sega CD. The surface mounts were easy (hot air with tinfoil blockers). Where it really got to be a pain was the power/audio board. The through holes in there all go to ground plane, and it makes removal tedious. I tried every trick in the book from desoldering gun on down to wicking. Eventually I was reduced to heating legs with a blade iron tip and pulling the caps out the other side. Follow my projects on Twitter! That is not not a great way to remove surface mount capacitors and I wouldn't offer this suggestion to a newbie. Its a great way to damage a board. Last edited by segasonicfan; 02-11-2019 at 07:46 AM. Watch him use tinfoil in that video and then come back and chastise me. Last edited by Firebrandx; 02-11-2019 at 10:23 AM. I wasn't trying to come off as chastising. I respect your work and I think you have a cool website. I watched the video and Im sure the method works, maybe even well for both you and voultar. I'm just saying this is not a great way to do it, there are better ways. I think encouraging a newbie to take a hot air gun to a motherboard is a bad idea. I broke motherboards with unnecessary heat if I think back to my early days. It's not easy to know how much heat to apply with a hot air gun, it's a learned skill and it's easy to knock other components loose. It's also unlikely that newcomers to the hobby would have access to a hot air gun. Many people resort to using blow dryers thinking they are the same thing and cause serious damage to good motherboards. Hot air rework can also warp a PCB and cause other issues. I simply wouldn't use it for something as simple as a recap. Last edited by segasonicfan; 02-12-2019 at 01:08 AM. I definitely don't have access to a hot air station. Just a relatively low-end Weller soldering station.